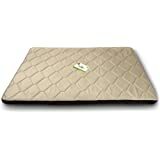 Sold by allwiner and Fulfilled by Amazon. Gift-wrap available. 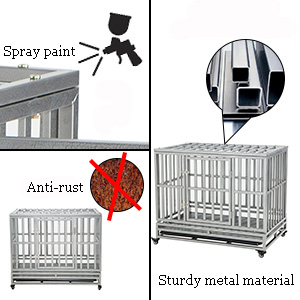 Amazon's Choice for "steel dog crate"
Heavy duty frame: made from rust and corrosion-resistant steel,strong and durable, hard to be damaged,nontoxic finished surface keep your dog health and render excellent anti-rust ability,suitable for most medium and large dogs,two locks with the safety buckles to prevent the dogs from opening the door and escaping. 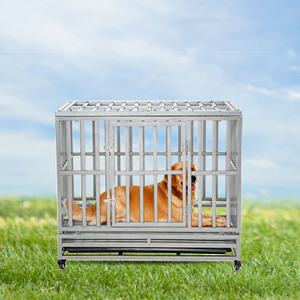 Double door & locking caster design: The front door is suitable for pet in and out,the top door also can be opened for you interacting with your dog. 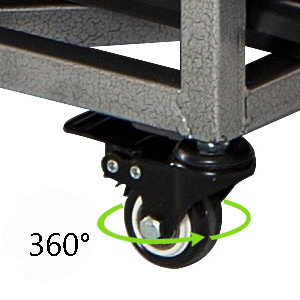 360 degree rotated locking casters can help you to move crate anywhere easily and lock the wheels to keep the crate in place. 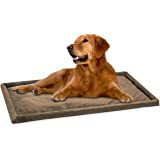 Easy to clean:Removable (slide-out) plastic tray helps you to catch the fallen dog food and excrement,and allows you to wipe and clean easily. 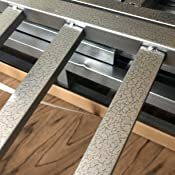 Easy to assemble:All hardware pack included,just need to fit it with four wheels and eight screw bolts, locks were pre-assembled,Just takes 3-5 minutes to complete. 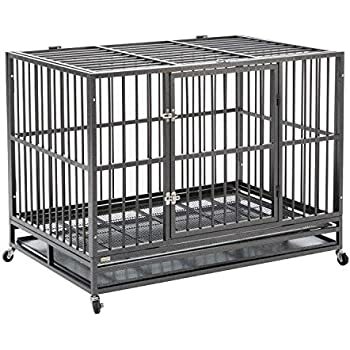 Overall Dimensions: 41.5"L X 30.5"W X 37"H; Internal height of the dog cage (excluding wheels): 32"H; Metal pipe spacing:2"; Metal"slat-like" floor spacing:1" Color: Silver with Black Crackle. Attention:if you have any product quality problems, please feel free to contact us.We offer a three-year warranty. Sold by allwiner and ships from Amazon Fulfillment. 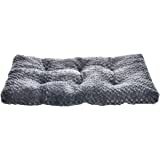 Sold by Zenwise Health and ships from Amazon Fulfillment. 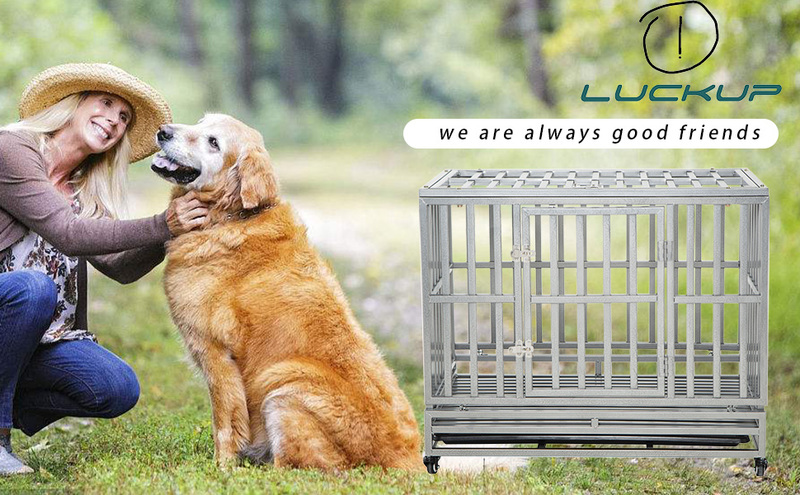 For pet supplies, we continuously optimize and develop. 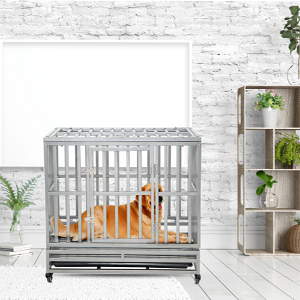 For quality, we conduct strict checks.Our goal is not only to provide a warm home for dogs, but more importantly to narrow the distance between pets and people. 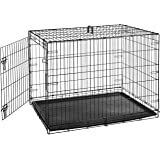 Heavy duty dog crate comes in two different sizes,38 inches and 42 inches,Suitable for dogs of different sizes. If the dog is large in size, don't worry, the 42-inch model is enough to accommodate it. The tube adopts precise spray paint technology, and no rust is a major feature. The material of the tube is a solid metal pipe. 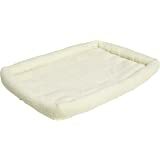 The tray is not easy to damage, elastic material, very convenient for the dog's cleaning work. The wheel is a universal wheel that can be rotated 360 degrees. 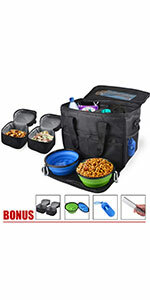 It is equipped with a lock, which can be fastened by pressing the lock button. 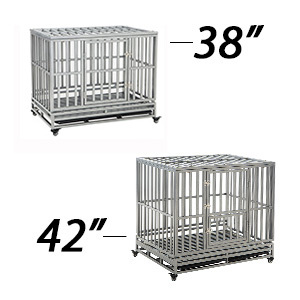 42 INCH 42" M 48" 36'' Heavy Duty 42"
We ordered this crate for our German Shepherd Mix who is a bit of a Houdini. In 7 years we have gone through 4 plastic crates and 3 wire mesh ones. 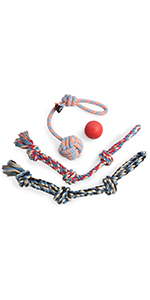 He chews and pushes his way through weak points in other crates. 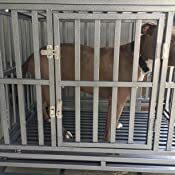 Most recently he chewed or forced his way literally through the wires of his wire crate which we had zip tied shut because he kept forcing open the door. We decided we needed a bit of an upgrade. First, the shipping was fast. 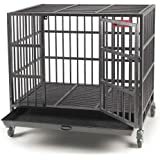 We ordered the crate on a Saturday or Sunday (I forget) and were stressing a bit as the crate wasn't due to come until Thursday leaving us two days where our dog couldnt' be crated. Imagine our surprise when the crate actually arrived on Tuesday! It was great and a huge relief. The crate was easy to put together and was very roomie. Our boy is about 80 pounds and could stand and turn around comfortably. We did end up putting plywood down since we didn't know if the floor part would be that comfortable for our dog, hence the 4 stars. We also put a dog bed in for him. We did put another latch on the door since he does have a tendancy to push his way out but so far it has been good and with the 3 latches it came with and ours it doesn't look like he has been able to cause any give. 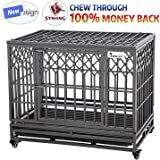 One thing I think will be good is that with the separate horizontal and vertical bars being split even if he does chew at the bars I just don't see him getting out as it would be individual as opposed to a wire crate where one bar goes and the entire wall is compromised. Hoping this is the answer to all of our previous problems!! 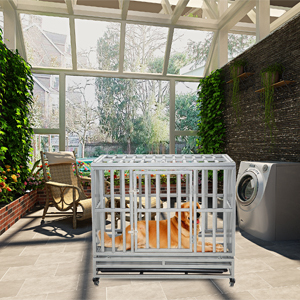 This “lion cage” as we affectionately call it, has saved our family. 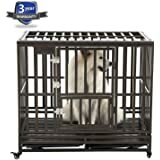 We were at our wits end with our husky puppy breaking through four different kinds of kennels, even the “heavy duty” ones. We bought a dozen carabiners and she somehow broke those too. 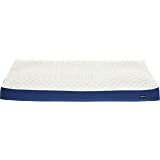 Even a $10 one from REI. We would come home to a disaster, with couch cushions and kids toys and shoes and everything in between destroyed. We were also afraid that she would only get partway out one day and strangle herself. She used to have complete meltdowns in the kennels she could escape. But this one, I think because she knows she really cannot escape it she lays in there calmly. And the bottom may seem strange to some people. But It does not bother her at all. What bothered her is when she would chew plastic shards off of the trays of her other kennels. It was so dangerous. We were out of options and considering rehoming her to a family that doesn’t have to kennel her. She’s happy and we are happy. 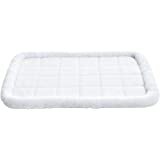 Thank you so much for this product. 1.0 out of 5 starsCAUTION! 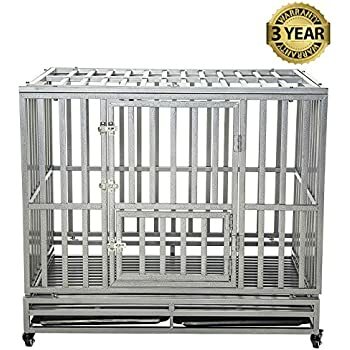 We purchased the dog cage to try to contain our dog with severe separation anxiety. We were excited the bars were sturdy, the latches however were not. 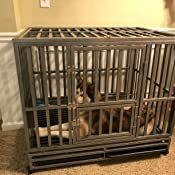 On 2-15-19, my 14 yr old son came home to find our dog hanging in the cage. He bent the top latch, squeezed his head through the door and choked to death. 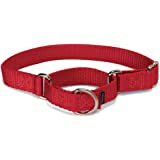 Had the latches been stronger, our dog would be alive. 5.0 out of 5 starsSAVING GRACE! Thank goodness for this cage! I adopted a Pittie who has terrible separation anxiety. He bent the bars on the standard black kind w/pan insert, chewed a few of the pan inserts and sat in his mess which then required daily baths after an already exhausting day at work. 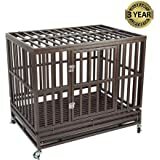 Don't misunderstand me - it looks like a jail cell or lion cage, but was EXACTLY what my guy needed. The mess goes right into the bottom so I don't have to worry about him sitting in it all day or creating more mess for mommy to clean up. I do wish it came in another option as far as color, but this thing is pretty close to perfect otherwise! 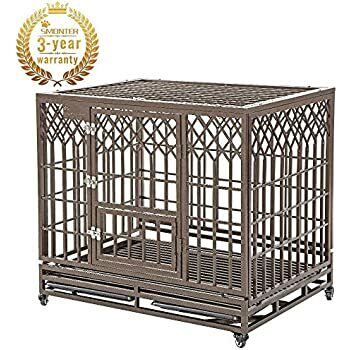 Could be a potentially great kennel, but poorly soldered, damaged upon shipping, with two pieces of the kennel loose which I found on the floor having left my puppy alone for a few hours. 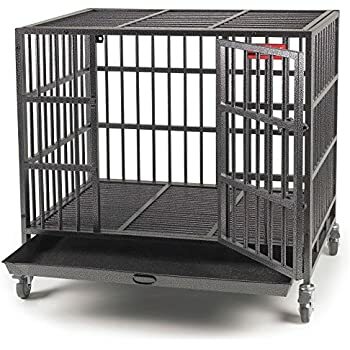 I got a 80 pounds dog so you can imagine it's hard to find a good dog cage to lock him up. 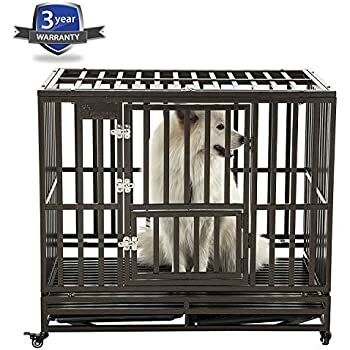 I've tried several cheap ones in the past, but those were either too small to fit him which made him upset, or too fragile that he could break the cage by himself or even chew through the bars. 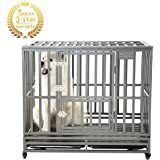 I finally decided to get a more expensive one, and this dog cage didn't disappoint me! 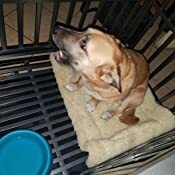 Very spacious, my dog seemed happy with his new "condo", and stayed inside for hours without complaining. I felt like I could even put myself in it. Very good quality. 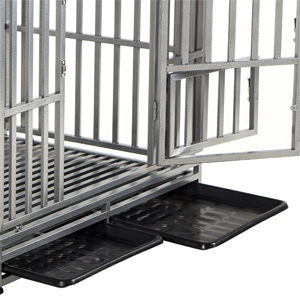 The bars looked strong and durable, and there were plenty of latches for opening the cage from different locations. I really liked the door that could be a small opening or a big one. And the opening on the top makes it easy to pat him for comforting. There were 2 removable plates on the bottom to make cleaning easy. And it came with wheels! Moving the cage was easy and effortless. Installation was easy and took me just minutes from opening the package to complete installation. 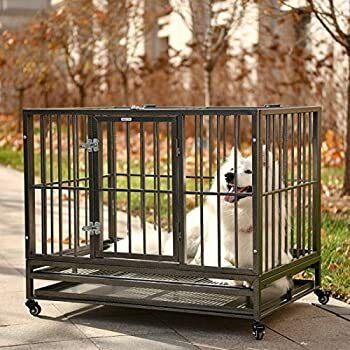 Finally found a cage to make both the dog and myself happy! 5.0 out of 5 starsDefinitely worth the money! 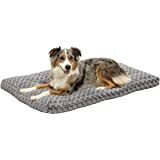 Absolutely perfect for my husky! She has not been able to escape and get out. Would have given it 5 stars but I think the positioning of the latches could be better. Since my dog is an escape artist I decided to do a little modification of my own. All you need is a rivet gun and a drill, a center hole punch would help out also. I also decided that I didn't want or need the small bottom door so I secured it shut. 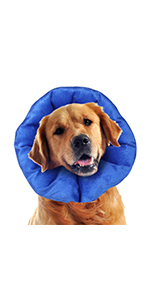 I may do the same to the top, depends on whether or not my dog tries to force it open.